Many outstanding buildings been created by Norman Foster and the partners in his architectural practice. They include Chek Lap Kok airport in Hong Kong, the Nimes Carré d'Art gallery, Berlin's Reichstag, the Swiss Re "Gherkin" in London, the Sage arts centre in Gateshead, and the fabulous Millau viaduct in France (my personal favourite). These are both works of art and funtional structures, and we are lucky to have an early Foster building near to our home here in Norfolk. Robert and Lisa Sainsbury were avid art collectors who had amassed a fortune from the eponymous supermarket chain. When they were looking for a university to donate their collection to they wanted their collection to be kept, and displayed, in one location. The new University of East Anglia campus at Norwich had space available, and was already a showcase for contemporary architecture with Denys Lasdun’s famous designs for the main buildings. 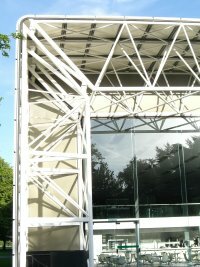 The Norman Foster designed Sainsbury Centre for the Visual Arts opened in 1978. Its radical and forward-thinking design is classic Foster. 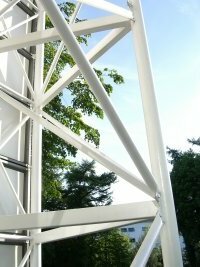 It uses advanced materials and construction techniques to combine open-plan galleries, offices for staff and faculty, teaching spaces, and café all under one roof. The Centre has followed MoMA in New York with a major refit, and reopened just two weeks ago. All photographs by Pliable and (c) On An Overgrown Path. Some arcane technical stuff for other Blogger users. After endless problems uploading images using Internet Explorer as my browser I switched to Firefox for this article. All images uploaded first time without a problem. Firefox is a free download. One of Norman Foster's latest completed projects is the Hearst Building near Columbus Circle, in New York. Check out at http://www.hearst.com/tower/ . Thanks for that link Konrad, there are a lot of really useful resources there - particularly the Photo Gallery. What makes the Hearst Tower unique among Norman Foster buildings is the way it is grafted onto Joseph Urban and George P. Post & Sons original 1928 International Magazine Building on Eighth Avenue. If only the 'completions' of musical fragments such as Elgar's Third Symphony were delivered with such imagination and panache. Sir Norman Foster's homepage (www.fosterandpartners.com) is also a good destination, with an index of all his projects, including recent designs for unbelievable constructions in Russia, a skyscraper in Moscow and an amphitheater in New Holland, close to the Mariinskii in Petersburg. I wonder if the Russian oligarchs (and the government consequently) will still have enough money to fund these projects to their completion. Follow this link for a Norman Foster thread over on Garth Trinkl's ever relevant Renaissance Research blog.